Boys’ basketball won against St. Francis 68-53 on senior night. The Wolverines’ overall record improves to 15-5 and league record of 3-1. Before the game, forward Kyle Hearlihy ’19, guard Darren Long ’19 and guard Trae Meyer-Walley ’19 were honored in a senior night ceremony. All three seniors, along with guard Johnny Juzang ’20 and forward Mason Hooks ’20, started in tonight’s contest. To start the game, Meyer-Walley drove to the basket and scored for the Wolverines. Shortly afterwards, Juzang hit three three-point shots, giving the team an early lead. Juzang said that the game’s momentum and early lead was key to the win. Three-point shots were a trend throughout the game for both teams and the Wolverines’ sharp shooting gave them an edge. Wing Brase Dottin ’20 said the quick start set the tone for the game. Throughout the game, Head Coach David Rebibo switched out players and all the guys on the court were able to share the ball. Every player on the Wolverines’ roster scored a point. Holden McRae ’20 said that with the seniors in mind, the team worked well together. The Wolverines had a clear size advantage on the St. Francis Knights, which led them to be more in control on defense. “Everybody played with great intensity and despite a couple of miscues, we were pretty solid defensively which helped us secure the win,” McRae said. With a comfortable lead, for last two minutes of the game, the players on the court were the three seniors, along with guard Cameron Thrower ’22 and wing Adam Hinton ’21. Thrower, as the only freshman on the team, commented on the feeling of senior night. 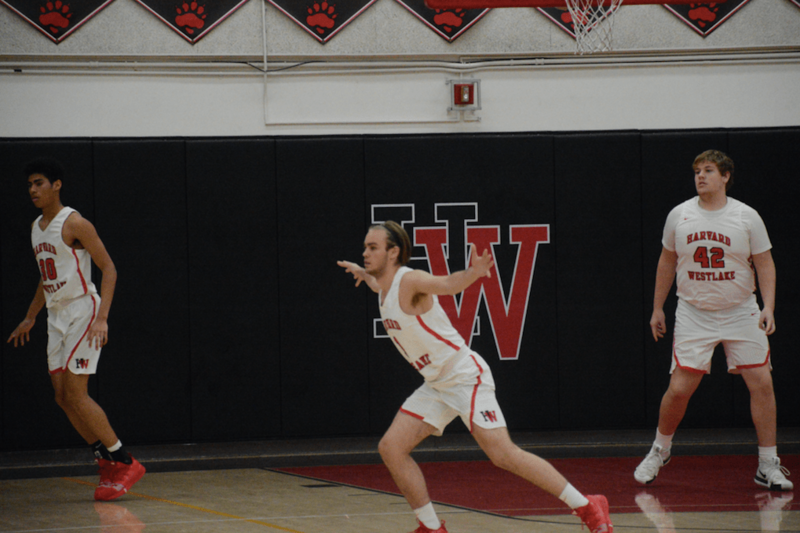 The Wolverines have two more league games left until the Mission League tournament, followed by playoffs. McRae talked about the team’s progress and the mentality heading deeper into the season. The squad’s next game is against Westchester High School in the Rolling Hills State Preview at Cerritos College with tip-off scheduled for 7 p.m.